An earnest and entertaining look at stock market skulduggery, constricted by its adherence to genre convention and further comprised by its commercialism, Money Monster has two shining stars in front of the camera and one at the helm. Jodie Foster directs George Clooney and Julia Roberts in a socially conscious hostage thriller. ‘You don’t have a clue where your money is,’ spouts Lee Gates (Clooney) as he describes a brave new world built on greed, speculation and blind trust. Lee is the motormouth host of a Mad Money-style show. Roberts is his director Patty, the calmingly maternal voice in his ear. Professionally composed, boy is she gonna need to be as, mere moments into the live broadcast, Lee is taken hostage by disgruntled blue-collar investor Kyle (Britain’s Jack O’Connell), who forces him into a bomb vest at gunpoint. Prompted by Lee’s enthusiastic advocacy, Kyle has seen his $60k inheritance shrink to nothing after taking a punt on IBIS Clear Capital, run by Dominic West’s Walt Camby. The company’s value subsequently plummeted by $800 million overnight, with a trading algorithm gone haywire the apparent explanation. Kyle wants real answers; and Lee and Patty, too, begin to smell a rat once they crack the facade of IBIS’s spin doctor Diane (Outlander’s Caitriona Balfe) and enlist her help to uncover the truth. The film’s righteous rage comes alive in O’Connell’s twitchy turn, and a scene where he’s mercilessly dressed down by his girlfriend (Emily Meade) in front of a dumbstruck nation cuts through the gloss of the production to deliver a moment that’s authentically raw. Other than the show seeming pretty awful, the media come off suspiciously lightly – these are far from the cynical operatives of the superior Nightcrawler. 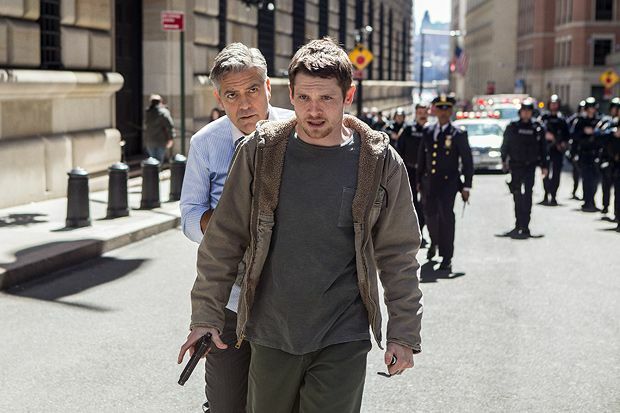 Both Patty and Lee are sympathetic to Kyle’s predicament and receptive to his viewpoint – Lee in particular transforms quickly from brash showman to supportive partner in crime, with the casting of Clooney helping hurry that process along. And, as the stand-off is taken to the streets, where they move at a crawl, the film bears comparison to the intentional absurdity of the Alan Partridge movie, Alpha Papa. Slick and succinct it may be but, given the watered-down treatment, this is less about exposing the arrogant individuals we entrust with our financial futures (here portrayed as a single bad apple) than it is about going through the Hollywood motions. Riveting performances, snappy editing and a smattering of excitement save a story that, at times, comes perilously close to being The Big Short For Dummies.